• Our rigid, quality boxes are made from a high-grade card stock. • Every box is folded, glued and wrapped in amazing finishes. 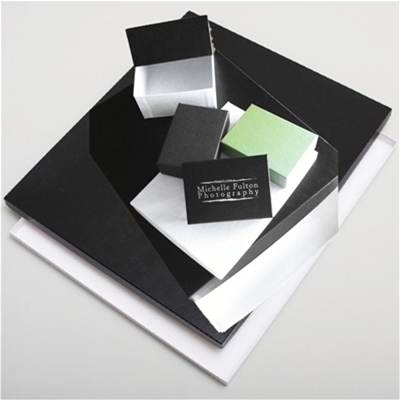 • Choose from black leatherette photo packaging boxes. SEE OTHER LINK FOR SMALLER SIZE BOXES!! • Add your studio logo to EVERY Premium Box! For a limited time, Just $49.99!! • Once your die is made we'll add just $0.25 per box to imprint them. BOX IMPRINTING ONLY APPLIES TO THIS PREMIUM LINE OF BOXES! NO OTHER UNLESS SPECIFIED! •• Call us at 800-558-0114 to place your imprinting order! IMPRINT COLORS: (See Foil Imprint Colors)PMS color match is not available. Our rigid, quality boxes are made from a high-grade card stock. Every box is folded, glued and wrapped in amazing finishes. on 12/21/2013 Best Boxes in America! As a photography studio we need high quality, sturdy, but elegant presentation boxes to deliver our portraits to our clients- and Pro Studio Supply has all this and more! These larger sized boxes fit all of our needs big and small. Whether its larger photographic prints, Holiday Cards, or specialty products, these boxes does it all! Ordering is easy and delivery is always fast. Lets face it, sometimes we all forget to order supplies until our stock pile has shrunk to almost nothing, but I call up the guys at Pro Studio Supply and always get my delivery faster then I expect! I have never run out of boxes in the 2 years that we have been working with them, and that makes me feel great that I can always count on them! If you are considering this product, stop thinking and just do it- it will be the best decision that you will ever make! We love you Pro Studio Supply!